This website is the sole project of Jeanne Oliver who is a professional guidebook writer specializing in Croatia. She has been writing about Croatia since 1996, not too long after the bullets stopped flying! It was that year that Lonely Planet assigned Jeanne to update the Croatia chapter in Lonely Planet's Eastern Europe 1997 edition. In 1998, she returned to Croatia to research and write the first edition of Lonely Planet's Croatia 1 guidebook which was the first guidebook in English to Croatia. She returned to Croatia regularly to write the 2nd, 3rd and 4th editions of Lonely Planet's Croatia guidebooks as well as the Croatia chapters for Mediterranean Europe , Eastern Europe, Europe on a Shoestring and Western Balkans. A particular pleasure was writing and researching Lonely Planet's Best of Dubrovnik. Jeanne also wrote Insight Guides Step-by-Step Croatia. Jeanne currently devotes herself full-time to Croatia Traveller, returning to the country each year to update croatiatraveller. See Jeanne's author page at Amazon for more of Jeanne's guidebooks. NPR (National Public Radio) interviewed Jeanne about Croatia travel. Listen to Jeanne's interview with hosts Alison Stewart and Luke Burbank here. The Guardian interviewed Jeanne about starting a successful website. Read it here. AAA interviewed Jeanne about Croatia's best beaches. Read it here. Budget Travel hosted on online web chat with Jeanne about Croatia. Read it here. 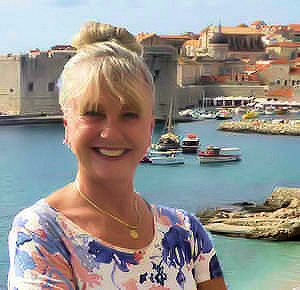 Inc.Plan named Jeanne "Entrepreneur of the Week" and interviewed her about starting Croatia Traveller. Read the article here. FIPP interviewed Jeanne about the challenges of creating travel e-books. You can read the article here. Kimkim talked to Jeanne about how Croatia has changed over the years and her favorite places in Croatia. You can listen to the podcast here. Over the course of the last two decades of travelling to Croatia, Jeanne watched Croatia emerge from the Balkan wars to become a massively popular tourist destination. Here's what she said to the newsletter of the Croatian Embassy in Washington DC recounting her experiences covering Croatia. Good and bad. On the one hand, there were still visible reminders of the war. The Esplanade Hotel in Zagreb had peacekeepers and officials coming and going. Zadar still had sandbags around the buildings and Dubrovnik had yet to repair all its roofs. Worse, from Istria all down the coast, people were morose and demoralized. The disruptions provoked by the war were still fresh in people's minds. On the other hand, the sheer physical beauty of the country was staggering. And there were no other visitors! Well, one. In Zadar, the chess player Gary Kasparov showed his support by organizing and playing in a local chess tournament. It was clear that a lot of work needed to be done to repair the tourism infrastructure, especially the hotels, but it was equally clear that once it was repaired, Croatia was going to be a massive destination. You can read the entire interview (in pdf) here. For Lonely Planet, Jeanne was also the sole author of Normandy 1, Crete 1 and Crete Condensed 1. She contributed sections to Germany 4, France 5, Brittany and Normandy 1 and Greece 6. For Frommers, Jeanne wrote Paris on $80 a day, Memorable Walks in Paris and contributed sections to Europe on $60 a day. Her articles have appeared in the Miami Herald, San Francisco Chronicle, St Petersburg Times, the Denver Post, National Geographic Traveler and the New York Post.